E. Dakota: Happy Spring ! I don't think I have to remind anyone that Spring begins officially this Sunday. Not with this weather, that is for certain. 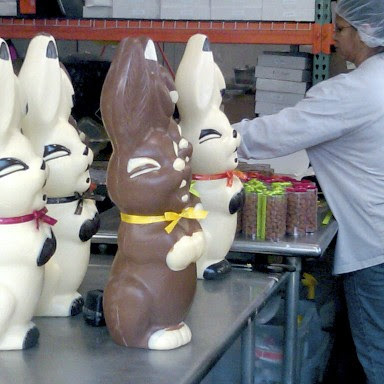 But if I'd forgotten, the worker bees were milling about with these larger than life Easter Bunnies in the windows of Jacques Torres this morning would have been a helpful reminder. It felt like the sneak peak of Santa's workshop in The Polar Express, and I didn't even have to get out of bed in the middle of the night. Enjoy your first weekend of Spring !! This is like a dream come true. Yum. O.